Thanks for the comment on my "Adaptation and the Wildlife Experience" post. I never really think about how long a post will take to write. Sometimes I start with a short comment on a blog then realise I need to add more than a simple comment. For the post on adaptation, the writing didn't take too long and all photos except the last picture are ones from my personal photo library taken over many years. What normally takes most time is researching what I write. I try to check the information I remember and can also find new interesting information. My posts help me learn more. In the adaptation post, one of the bigger learning points is on convergent evolution. Scientists know simply because animals or plants have parts looking similar, it doesn't mean they are closely connected to each other. It just means they have developed something similar to do the same sought of tasks. Bats and birds both fly but bats are mammals like us and are not birds yet both have wings but bats have hair and birds have feathers. Humans and gorillas are much more closely related. We are part of a group known as hominidae (or great apes) including chimpanzees, gorillas, and orang-utans. I also love animals (and enjoy knowing about plants, rocks, space, and so many other things). My university degree is in science and included studies such as animal physiology (how living things work) as well as animal behaviour and even psychology so I could better understand people as a teacher. There is so much of interest for us if we only take the time to find it. Ben and Jerry? It sounds like the American ice cream company. 🙂 They're cute names for the possums that visit your yard. I find all animals interesting, even snakes and other reptiles, insects and other invertebrates (animals without backbones) and microscopic life. I do have a respect for more dangerous animals because we need to be safe but that doesn't stop me being interested. This young wombat is Bert. He was orphaned when he lost his mother. Volunteers at Potoroo Palace look after injured and orphaned native animals. 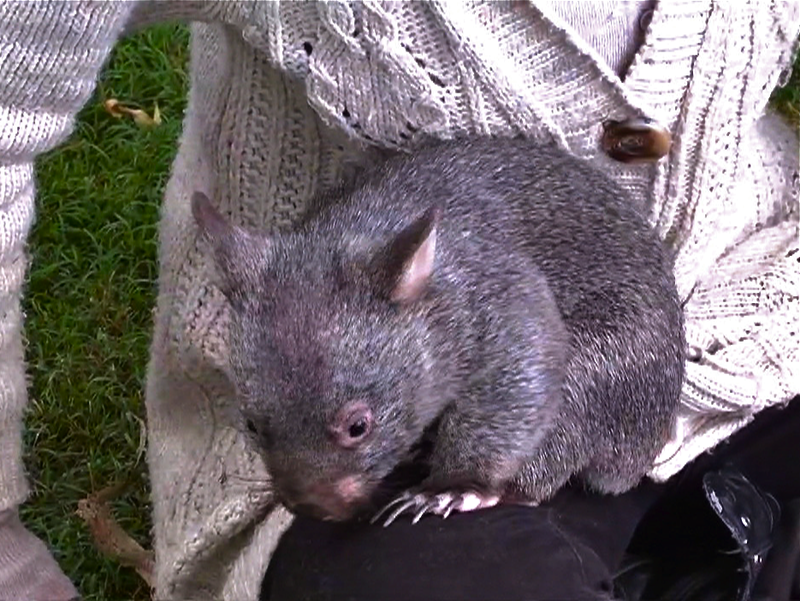 Here is a video clip I loaded in 2013 so you can see Bert, a wombat joey, exploring visitors to Potoroo Palace. The old family farm use to have pigs and I see wombats and wombat holes around my town when hiking but I've only seen sloths, pandas and flamingos in zoos. Keep learning. There is so much out there to know. Posted in Animals, Australia and tagged wombat, wombat joey on July 28, 2014 by rossmannell. Hi im Eevie from Miss Jordans class. What a fantastic post! You must have put a lot work and effort into writing it! Are class loves that you write extended comments for us, and we really appreciate it. We learn a lot from your great comments! Apes and gorrillas almost seem human! They are so alike us, even though they are different. I think that what makes them so interesting is that they are like us, but they look different and sometime act different like pulling bugs out of each others fur. I think animals are awesome and fun to learn about. I love learning about there habits, habitats, the food they eat and what they look like. Even though you didn’t mean the Ben and Jerry ice-cream, im just going to mention that i love eating it. Iove all the different flavors they make! Do you love Ben and Jerry ice-cream? I think that Ben and Jerry are very cute names for possoms! I bet that they are really cute! I mostly find animals like pandas and wombats and small animals more interesting then others, and i don’t know why. I just don’t know much about them. Hope you like my comment! The writing of the post doesn’t take long but checking information can. The post would have taken around an hour to put together because it is a reasonably simple one. Some posts have taken many hours because of the amount of information and links needed. Apes pulling bugs out each other’s hair is known as grooming. It’s the way they bond (stay as friends) in a group. Do we do this? Can you imagine the first activity when out on the playground would be for friends to sit around grooming each other? Sounds funny but think of this, do you like it when someone brushes your hair? It can feel nice and, while the person brushing isn’t normally looking for bugs, it is a form of grooming. Like you, I enjoy learning about animals and their habitats. That’s why may science degree was mainly concerned with animals. They can be fascinating from the tiniest up to the blue whale. Ben and Jerry ice cream is available in my local cinema (movie theatre)and I have tried some of the flavours but the cinema staff know I like a chic-top ice cream best. Yes, as well as many other things, I like films and I enjoy going to the cinema. Sometimes to take a break from editing videos on my computer’s small screen, I go to the cinema to watch the big screen. The project involved filming from before dawn until 8pm one day then before dawn till 4pm the next day. It was a great deal of fun and involved a lot of hiking around to join as many of the groups as possible. On the first day, a number of school students were involved, mostly in bug hunting. Keep your eyes open to the world of animals. There is so much yet to be learnt.